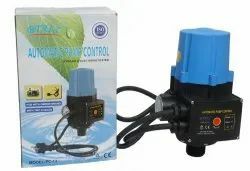 DESCRIPTION: The product can rplace the complicated installations of automatic water pump e.g. pressure gauge, pressure switch, T-valve, check valve and pressure tank. It has the feature fo stable performance. low maintenance and long life etc. It will indicate teh pump has started when the green light power on lights up after connecting teh power. When the yellow light pump on lights up, it indicateds the pump has been started. The pump continues to operate for few minutes enabling the system to fill in the pipes and to reach the required pressure. If this lapse is insufficient the red light failure will light up. In this event, keep the restart button pressed and wait with a tap opened till the red light is off. Once released the button and closed the tap, the product will keep teh pump at its maximum pressure. • The product is designed especially for all control operation of automatic water pump. • If the particular breakdwons occur, such as water failure, obstruction of the suction pipe etc. • Its starting flow is about 36-60 l/h and is convenient for home application.